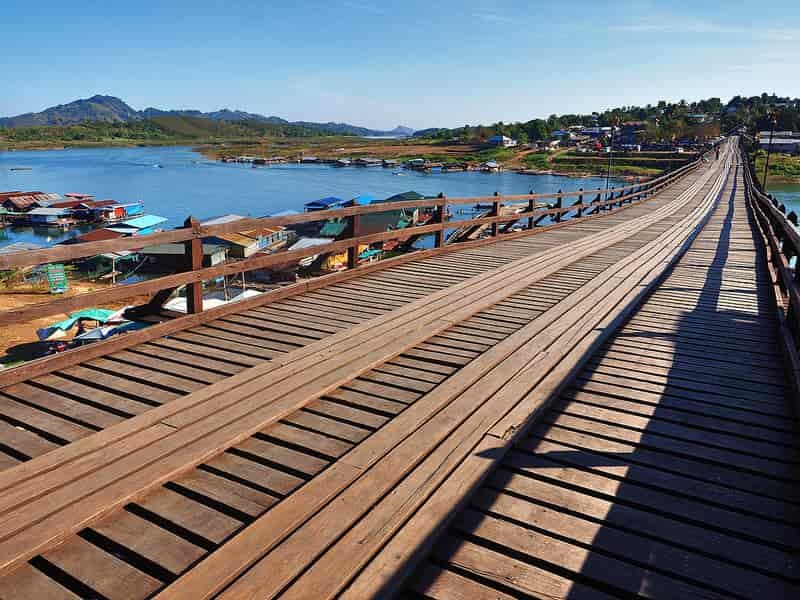 With a rich history and exotic cultures, Kanchanaburi is frequently visited as base of operations for exploring the many cultural, natural, and historical attractions in the surrounding countryside. 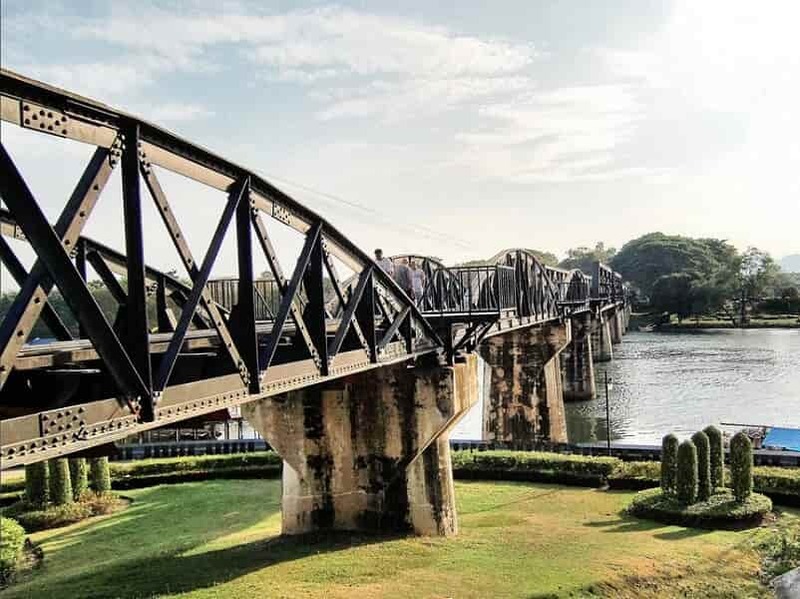 On this Explore Kanchanaburi & Sangkhla Buri Tour, we start from Bangkok, then head to the famous market before reaching to the notorious "Bridge on the River Kwai". Visit historical sites like Hellfire Pass, Thailand-Burma Railway Centre Museum to learn about Kanchanaburi’s dark past. In addition, we also visit the bustling border town of Sangkhlaburi to better understand the lifestyles of Mon ethnic minority. 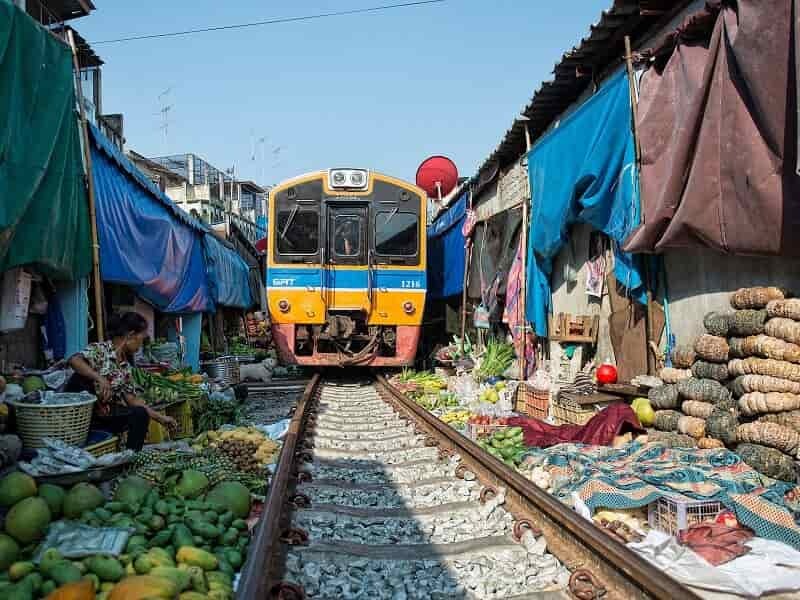 From BANGKOK, you will be picked up at the hotel and taken for a trip to the famous Maeklong Railway Market, a most unusual market because a train passes through the market 8 times a day. You can find everything here from the traditional to modern, every kind of food, fresh vegetables, fruits, fish, meat, clothing, and much more. As soon as the siren signals the arrival of the train, everything stops. Shoppers take their goods inside and vendors pull back their umbrellas, open and close their stalls in a matter of seconds! Once the train is gone, all the goods go out again, the umbrellas unfold and its business continues as usual as if nothing happened. Then we will visit Damnoen Saduak Floating Market. 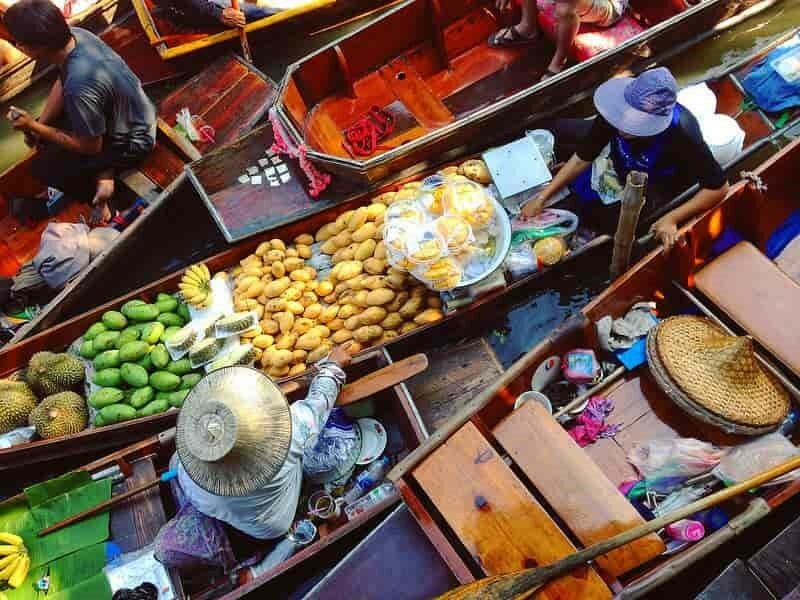 Walk around and check out the many stalls or take a boat tour to explore the area and there are boats serving as shops, selling food and drinks like noodles, beer, cold drinks, coconut water, corn etc. In the afternoon, take a leisure walk through the historical Pak Phraek Road. 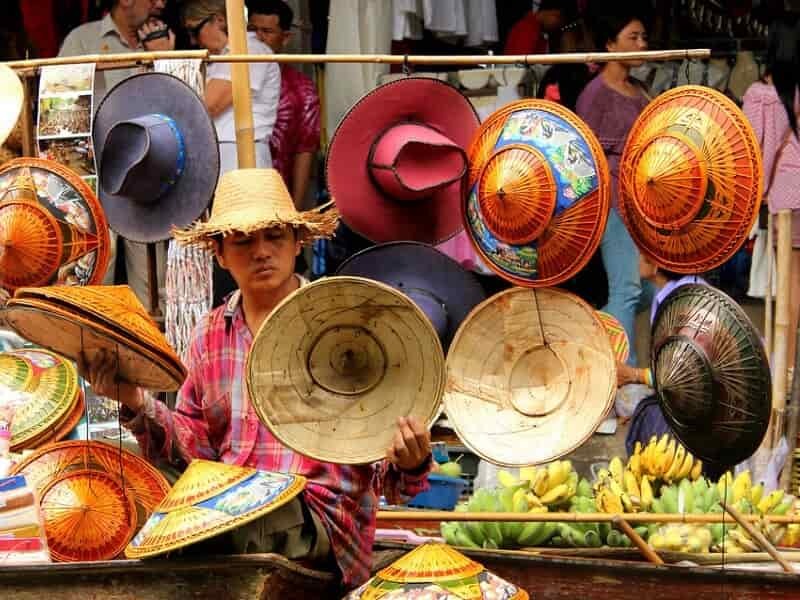 It is located in the Kanchanaburi’s ancient region where the walking street and night market is organized and variety of products is sold to the tourists. The night market starts from 18.00 on Saturday. After early breakfast at the hotel, depart for a visit to the War Cemetery and Thai Burma Railway Museum. This two-floor museum is full of interesting displays and artifacts from the workers on the Death Railway. Then, drive to River Kwai Bridge Train Station for a short train ride (departs at 10:50AM and arrives at 11:57AM) along the infamous “Death Railway”. The train passes over the wooden viaducts along the River Kwai and allows you to take in gorgeous views of the surrounding Kwai Gorge. Have your lunch at a local restaurant. Wake up early in the morning and give alms to monks in Mon Village, then go back to the hotel for breakfast. 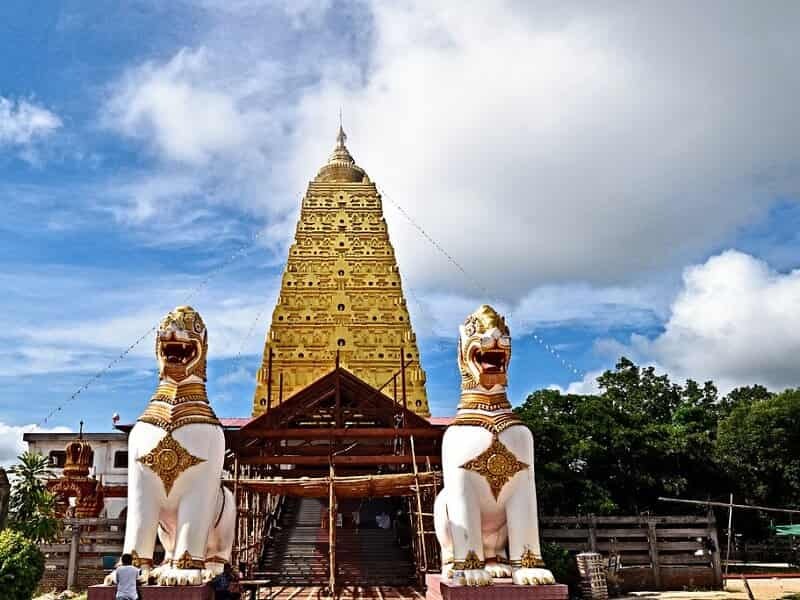 After breakfast, drive to Wat Wang Wiwekaram, also known as Uttama Temple. It is the most important and most revered Buddhist temple in Sangkhla Buri district, where Thai and Mon people live together peacefully. The temple was built to replace a previous temple which is now underwater due to the construction of Khao Laem Dam. 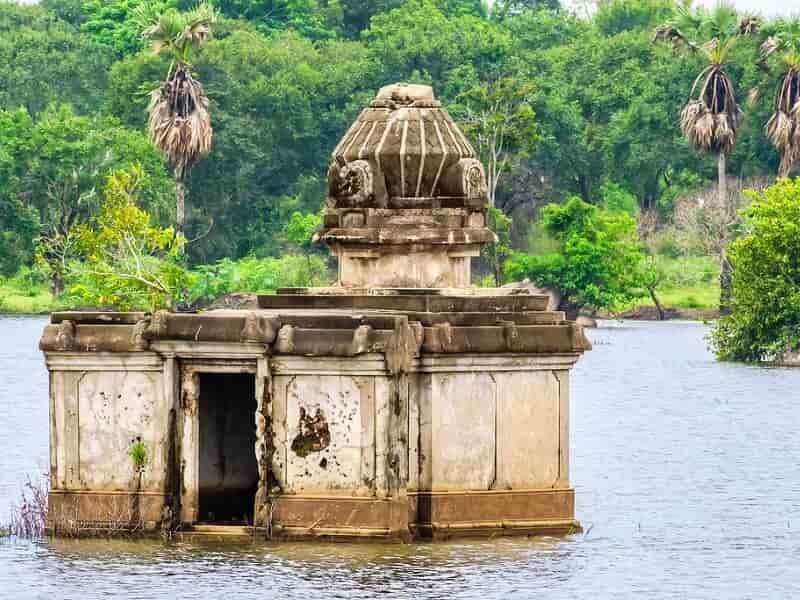 After that, take a boat trip on Sonkaria Reservoir to visit the Sunken Temple, or Wat Saam Prasob, one of the area’s must-see “Unseen Thailand” attractions.. When the water level is low, visitors can even enter the temple and discover the sculptures, although during the rainy season, it may only be possible to see the top of the temple protruding from the water. After lunch, you will be transferred back to KANCHANABURI and then head straight towards the safari-style tented camp on Hintok Mountain for an overnight stay. Located on a gigantic cliff overlooking the River Kwai, this resort is the great holiday destination in the abundant green nature of Kanchanaburi. 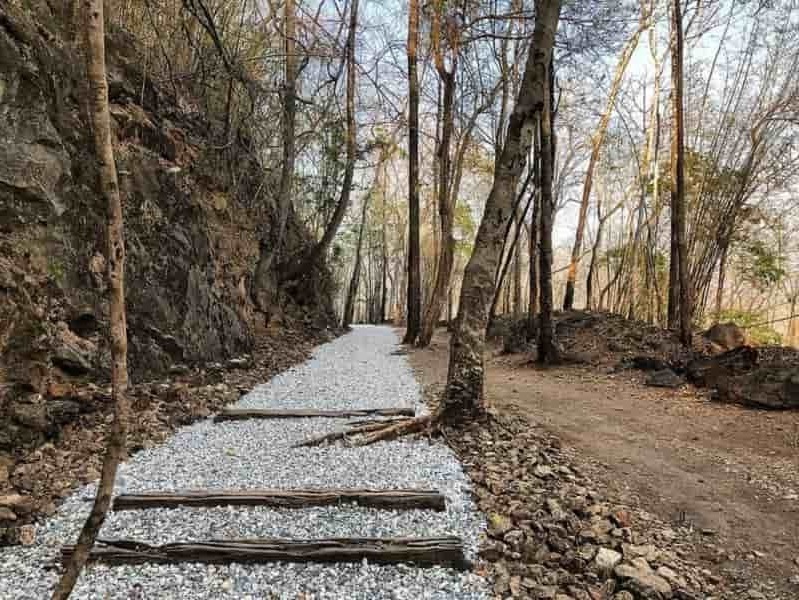 This morning, go on a short walk on the famous Hellfire Pass Walking Trail, where Allied POW and Asian slaves were forced cut through solid rock under treacherous conditions, with little rest or food. Then head to Hellfire Pass Museum for a more in-depth look at the area’s history. Learn about this tragic period in human history, with a range of exhibits and touching memorials to those that suffered here. Afterwards, depart for Sai Yok Yai Waterfall, which is famous for its idyllic beauty and was even visited by King Rama V in 1877. There are a number of both Thai and foreign tourists coming to visit this place throughout the year. Have your lunch at a local restaurant overlooking the waterfall before driving back to Bangkok. End the Kanchanaburi Sangkhla Buri Exploration.